Canada is a multicultural country whose exciting cultural diversity is due to its ethnocultural make-up. 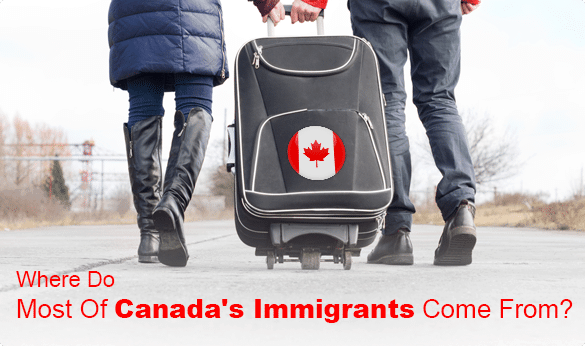 The vast majority of Canadians are descended from immigrants, and many are new immigrants. Historically, most immigrants came from Europe. But patterns of immigration change over time, and currently the largest group of new Canadians are from Asia. Immigration is still booming in Canada. 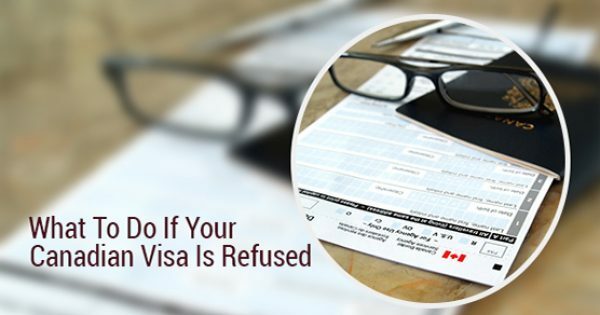 According to Statistics Canada, in 2011 over 20 per cent of the entire population were foreign-born. (2011 is the most recent year for which there is data). 20 per cent is almost 6.8 million people—and it’s rising. Canada has the highest proportion of foreign-born citizens in the G8. Where are these immigrants from? 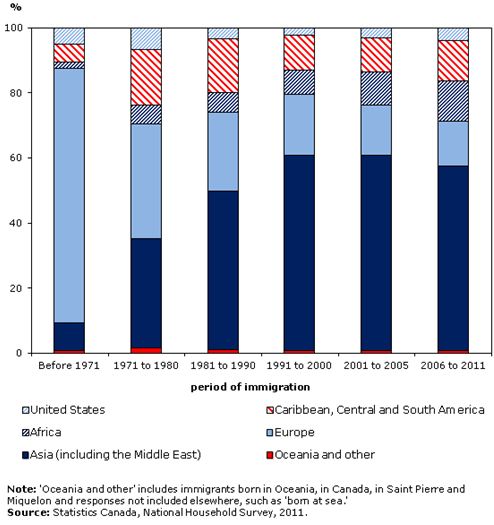 This chart shows the regions of birth by period of immigration (2011). Canada’s immigrants come from almost 200 countries. 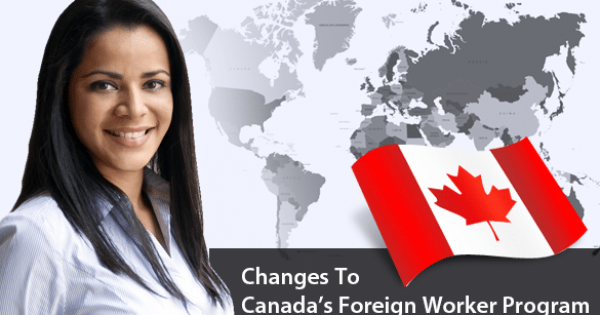 Asia—including the Middle East–provides the majority of new Canadians: about 60 per cent of all immigrants. The Philippines was the top source country, providing about 13 per cent of all newcomers. China and India were the third and fourth. Times have changed from the 1970s when about 78 per cent of immigrants were from Europe. The 2011 survey found only 14 per cent of immigrants were born in Europe. The top European source countries are the United Kingdom, France, and the Russian Federation. More people from Africa are now immigrating to Canada. The number of African immigrants has risen from 10 per cent to 13 percent, with most new Canadians from Algeria, Morocco, and Nigeria. The Caribbean, and Central and South America region top source countries are Colombia, Mexico, and Haiti. Where do new immigrants live? The vast majority of newcomers to Canada—almost 95 per cent–moved to just 4 provinces: Ontario, BC, Quebec, and Alberta. Immigrants tend to move to areas of higher employment, particularly in urban areas. This is evidenced by most new Canadians moving to large cities: 91 per cent of all immigrants. And of these, most newcomers moved to the 3 largest cities in Canada: Toronto, Montreal, and Vancouver. Newcomers make up almost 7 per cent of Toronto’s total population; over 5 per cent of Montreal’s; and almost 7 per cent of Vancouver’s. As most people immigrate for the opportunity for a better life, the vast majority are of working age. Almost 59 per cent of newcomers were aged between 25 and 54.